I've not tried either of these (especially right now as I'm still sugar free and white flour free) but I'd be interested in knowing if my readers have tried either of these! 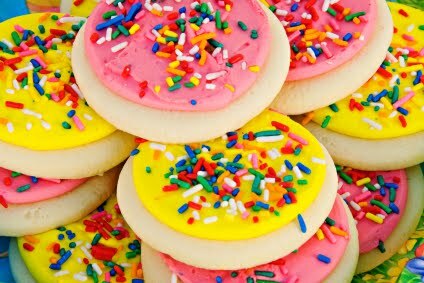 Be assured however, almost ANY plain cookie will be gobbled up if you use a mound of brightly colored frosting and sprinkles. Happy Easter and have a great day! Preheat oven to 375 degrees. Cream butter and sugar together until light and fluffy. Roll into 1 1/2 inch balls and press slightly flat with a sugar covered glass. Bake at 350 degress for 8-10 minutes. Frost and sprinkle to decorate. Makes enough for about 3 dozen cookies.